STREAKS, STATS AND NOTES — Could be swing game in division race, with Cowboys seeking tie for first and Redskins going for two-game lead, head-to-head sweep with five games remaining. … Cowboys have won seven of eight Thanksgiving meetings between NFC East rivals. … Both teams in top five in scoring defense: Cowboys third (19.0 points), Redskins fifth (19.8). … Redskins making third straight Thanksgiving appearance and 11th overall. … Redskins seeking franchise’s 600th regular-season victory. Chicago (756), Green Bay (741), New York Giants (690), Pittsburgh (626) others with at least 600. … Redskins have forced turnover in 14 straight games, longest active streak in NFL. They have at least three takeaways in three consecutive games for first time since 2003. … With Redskins QB Alex Smith’s season-ending leg injury, former Texas Longhorns star Colt McCoy making first start since Dec. 14, 2014, 24-13 loss to Giants. His last win as starter was 20-17 in OT at Cowboys on Oct. 27, 2014. McCoy was 25 of 30 for 299 yards. … RB Adrian Peterson tied season high with two TDs rushing against Texans. He had 99 yards rushing in first Dallas meeting and needs two rushing TDs to pass Hall of Famer Jim Brown (106) for fifth on all-time list. … TE Jordan Reed had 10 catches, 95 yards, two TDs in his last meeting with Cowboys in 2016. … LB Ryan Kerrigan has 5½ sacks in past five games. 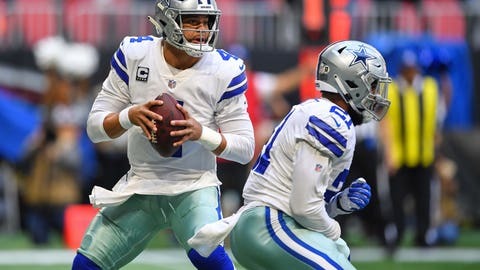 … Thanksgiving debut for Cowboys QB Dak Prescott and RB Ezekiel Elliott as rookies was 31-26 win over Redskins in 2016, team’s 10th straight victory. … Elliott has joined Hall of Famer Eric Dickerson and Edgerrin James as only backs with at least 4,500 yards from scrimmage and 30 touchdowns in first 35 games. Elliott has 4,540 yards, 32 TDs, including 388 yards, three touchdowns in past two games. … Elliott missed Thanksgiving last season on six-game suspension over domestic violence allegations. … Rookie WR Michael Gallup‘s status for game in question less than week after brother died by suicide. Gallup had first career touchdown in first meeting with Redskins. … LB Leighton Vander Esch has interception in each of past two games. He set club rookie record with 19 tackles, according to coaches’ count, in win at defending champion Philadelphia two games ago. … DE DeMarcus Lawrence had 1½ sacks against Falcons, now third in NFL in sacks since start of last season with 22½. … Fantasy tip: Elliott has consecutive 100-yard games, five for season. But Redskins haven’t allowed 100-yard rusher this season.